Microsoft SharePoint has established its position as a top collaboration platform for business. With its wide range of features, it can effectively manage and help share information, facilitate access to data, simplify the search for desired content, foster teamwork, and make the organization’s intranet environment thrive. However, having a great digital workplace doesn’t necessarily mean that you are taking full advantage of it. So the question is, how can you make that happen? The name of the game is to get deeper insights into how things work within your intranet and discover room for improvement, because there is always room for improvement. This requires a thorough analysis of all acquired data and implementation of the right analytic solution. Is your native intranet analytics solution cutting it? Even though it may seem so, the built-in analytics tool should complement SharePoint perfectly, the out-of-the-box toolset might not pass the test. If you want to speed up your business, improve infrastructure performance, boost productivity, leverage reporting, and enhance teamwork, then you might need to consider choosing a solution that is tailored to your organization’s unique requirements. 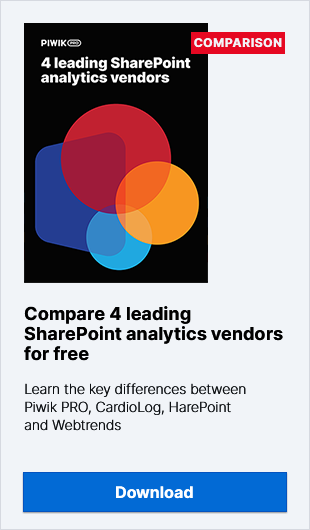 Learn how Webtrends, Piwik PRO, NGAGE and CardioLog Analytics differ from each other and find out which vendor fits your business’s needs. Learn what kind of information, types of documents users download and how often they do it, so that you can evaluate their reach and usefulness. Discover what is missing and how to fill in the holes. Such precise reports demand access to a specific information. Not all intranet analytics solutions enable that, but you may find ones which might be even integrated with a tag manager (like Piwik PRO). Merging a tag management system with your intranet analytics improves and speeds up the analysis of data collected from your digital workspace. You will get precise reports based on real time data analytics. Just set the right criteria to track data at the visitor level, whether it is the most active user, job title, location or department. In this way, you will analyze only the data that relevant to your specific business objective. Suppose you want to know what it takes for your employees to download your organization’s new overtime policy. The easiest way is to use the click path feature which lets you follow every step the user takes, in this case, to get the policy. You can define the number of steps to be displayed, estimate the average time of achieving the goal. You can also skip the paths which all users must pass through, so your tracking is easier to analyze. This feature reveals how users navigate the site and helps you undertake initiatives to improve its layout and content. Acquiring such knowledge will cast some light on user engagement and reveals how easy it is to find necessary content. This approach helps to identify your most engaged users and by showing recognition to them you may inspire other employees to follow their footsteps. Furthermore, by measuring participation over the intranet, you may discover what areas need revision, enhancement, where is a need for additional trainings. As SharePoint sites are a focal point of collaboration and sharing for your employees, you need to make sure they’re making the grade. Getting the full picture of the current situation calls for numbers, percentages calculated based on your intranet activities. However, having insight into your intranet stats requires interpreting them in the proper context, that is your KPI’s. The intranet analytics solution makes possible for you to dive into those issues, whether you need to evaluate bounce rate, page created conversion rate, user engagement, download rate of a new policy, submit rate for an internal recruitment application form, pageview rate, and much more. Your task is to define specific KPIs, choose suitable metrics, e.g. click paths, clickthrough, comments, impressions, unique outlinks, unique pageview, searches, and then draw up reports based on precise data. A tailored intranet analytics solution allows you to create and then track goals that will measure the success rate of your intranet site performance. Let’s say you want to know which of your trainees filled out the introductory survey posted on the HR website. First of all, if you are using a custom profile attribute in SharePoint you can map a particular attribute to the custom dimension in your analytics. You may create “Custom Dimension: trainee group”. As soon as this dimension is populated with values coming from Sharepoint, you can define segments. Then you can compare your “developer trainee” and “business trainee” performance towards fulfilling specific goals. Define the goal which you will track, in this case, “Submitting the survey”. You need to configure a new tag that will trigger a conversion when its submit button is clicked. So whenever someone takes the poll, the trigger fires the tag which is connected to the element of the form. It doesn’t matter if it’s an HTML form or your special customized form – Tag Manager can trigger goal conversion for any type of web form. Setting goals will tell you which site was visited, what file was downloaded, or when a visitor clicked on a certain URL link. In this way, you can track whether your website meets your organization’s objectives, at the department or team level. With a myriad of files, documents, and sites scattered across your intranet, getting the right content is challenging. Having an efficient, multifaceted tool which supports your effort to find the right data is a must. Learn what content is or isn’t available enough by integrating intranet analytics software which supports reports on keywords, click through, downloads, error pages, clicks. By acquiring such information, you can decide what content should be improved or removed and also how to rearrange it. This will make a real difference in search effectiveness and intranet users will be able to find valuable content within a few clicks. Integration of a dedicated intranet analytics solution with your SharePoint will let you flexibly collect data. It’s up to you to determine the range of data so your reports and analysis will be as accurate as possible. Some analytics solutions limit your data aggregation, while others (like Piwik PRO), provide you with access to raw data, so you decide how granular your data needs to be. What’s more, integrating your intranet platform with other systems and SharePoint Analytics enables you to pull information from SharePoint Profiles or Active Directory, then use it according to your organization’s specific needs. There are many ways to leverage the functionality of SharePoint. With the right intranet analytics software you can measure all the key actions relevant to your goals and priorities. Thanks to precise reports you will be able to make informed, data-driven decisions which contribute to the creation of an excellent digital work environment. If you want to know more about other issues concerning SharePoint Analytics, check out our other posts on building a digital workplace or intranet analytics tools. Let’s Meet in Cologne at dmexco 2017!